Leading Manufacturer of ampoule filler, glass ampoule filler, injectable ampoule filler, pharmaceutical ampoule filler, sterile ampoule filler and d type ampoule filler from Ahmedabad. We are leading manufacturer and exporter of Ampoule Filler and our product is made up of good quality. These machines are fondly used for high-speed filling of ampoules with maximum accuracy. With the fabrication being done with high-grade steel and modern-age technology, our offered machines possess high sturdiness and rust proof finishing. Moreover, we make the supply of these machines to our customers at reasonable price tags. 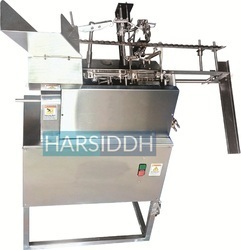 Harsiddh automatic ampoule filling and sealing machine is used to fill and seal injectable liquids in glass ampoules. Sterile and injection liquids are packed with this device in pharmaceutical industries. Mainly the machine is applied in research and development laboratories and pilot plant for liquid injection development. 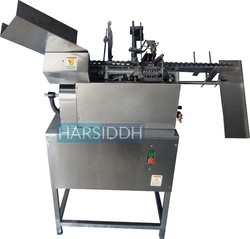 Harsiddh automatic ampoule filling and sealing machine is used to fill and seal injectable liquids in glass ampoules. Sterile and injection liquids are packed with this device in pharmaceutical industries. Mainly the machine is applied in research and development laboratories and pilot plant for liquid injection development.Filling and Sealing operations with ampoule filling & sealing machine is based on the principal of angle travel of ampoules. It takes cares of various parameters including thickness, neck dimension and quality of ampoules. It’s a great combination of flusher, filler and sealer. Traditional ampoule feed has been replaced with rectangular feeding system that is one of the important and highly demanded features in our system. This increases the stability of ampoules and prevents breakage.Automatic feeding, transfer, pre-post nitrogen purging, material filling, heating and sealing are executed and controlled with this latest technological advanced machinery. The inbuilt feature “No Ampoule, No Filling” is comprehensive for costly materials to feed precisely without wastage. The mechanism is competent for 1ml to 25ml open mouth glass ampoules with 0.5ml to 25ml filling efficiency in single dose. The filled production can be achieved from 10 to 15 ampoules/min based on ampoule size. 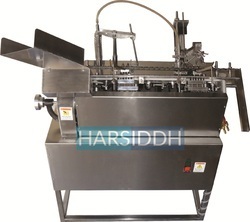 Harsiddh automatic ampoule filling and sealing machine is used to fill and seal injectable liquids in glass ampoules. Sterile and injection liquids are packed with this device in pharmaceutical industries. Mainly the machine is applied in research and development laboratories and pilot plant for liquid injection development.Filling and Sealing operations with ampoule filling & sealing machine is based on the principal of angle travel of ampoules. It takes cares of various parameters including thickness, neck dimension and quality of ampoules. It’s a great combination of flusher, filler and sealer. Traditional ampoule feed has been replaced with rectangular feeding system that is one of the important and highly demanded features in our system. This increases the stability of ampoules and prevents breakage.Automatic feeding, transfer, pre-post nitrogen purging, material filling, heating and sealing are executed and controlled with this latest technological advanced machinery. The inbuilt feature “No Ampoule, No Filling” is comprehensive for costly materials to feed precisely without wastage. The mechanism is competent for 1ml to 25ml open mouth glass ampoules with 0.5ml to 25ml filling efficiency in single dose. The filled production can be achieved from 10 to 300 ampoules/min based on ampoule size. With a gross weight of almost 70 kilograms, this particular equipment features a delicate and highly functional ampoule rotating unit. Capable of filling 10 to 300 ampoules per minute, Ampoule Filling Machine possesses a filling capacity of 0.5ml to 25ml per dose. This commercial-grade machinery has a single ampoule-opening nozzle and operates on a volumetric filling mechanism. Additionally, almost all the contact parts of the following equipment are constructed from AISI 316-grade stainless steel, thus imparting strength to this sealing and filling tool. Our machines have CE certifications.